So obsessed have I become with developing, photographing and posting recipes that I sometimes forget to tell you how much I enjoy eating. And, even more important, how much I enjoy eating other people's food. Eating out at restaurants isn't something I do often, not least because it's eye-wateringly expensive. In Cape Town, taking a family of five out to dinner at a decent restaurant leaves you, after wine and a tip, with very little change from a thousand rands. Okay, the something I make at home may not be sprinkled with bacon dust, or napped with a jus, or draped with - for heaven's sake! - mushroom foam. It might not taste as heavenly as a dish that's been slaved over for days by a professional chef, but it will taste good, and there'll be be plenty of it. In short, eating out often seems to me to be a shocking waste of money, and I'd much rather eat a plateful of honest food cooked by someone who cares about food, loves cooking to bits, and knows what they are doing. And that brings me round to my friend Judy. 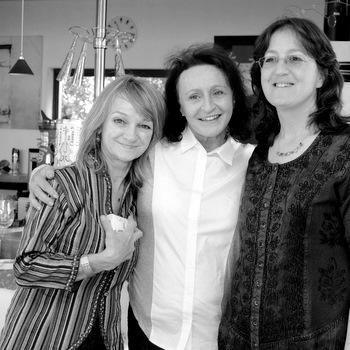 I've known Judy Levy (in the middle of the photograph, above left) for over 20 years, and I first met her and her husband, Cape Town photographer Barry White, when we were frisky youngsters with no money, no children, and not a care in the world. Judy, an entrepreneur with several successful small businesses under her belt, has no formal training and has never worked in a restaurant kitchen. Even so, she's one of the best home cooks I've ever met. Everything that flows from Judy's kitchen - and believe me, there is a lot of food - tastes wonderful. Judy has a fine palate and - like the best cooks - is insatiably curious about food and ingredients. 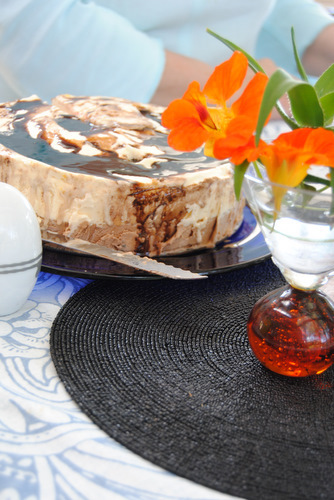 There is no fine-food supplier in Cape Town and its surrounds that Judy doesn't know. If she can't find the right ingredients, she grows them herself. At the moment, she's nurturing a crop of heirloom tomatoes, and growing her own pea-shoots in a bed under her kitchen window. 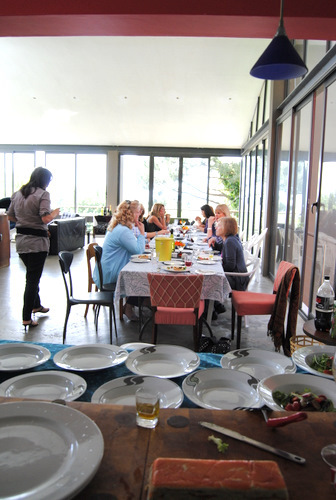 Last week, when Judy turned 39 (or so; thanks, Jude, send the cheque directly to me), she threw a lunch party for 30 of her best women friends. Being Judy, she didn't sit down for a minute, but worked like a whirling dervish to produce a light, bright and beautiful three-course meal, which she prepared and plated herself (with some help from her friends). On the menu? 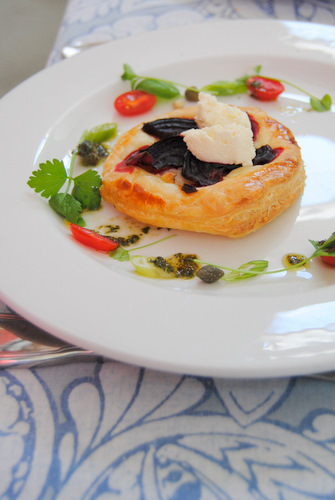 For starters, a choice of a beautiful Caprese salad, or a beetroot and goats' cheese tart, which was inspired, Judy tells me, by one of the signature starters at Cape Town's La Colombe restaurant. To follow, a delicate terrine made of smoked salmon, white anchovies, butter and lemon zest ('I got the idea from Masterchef', she told me), dressed with a zingy mustard vinaigrette, avocado purée, toasted hazelnuts and fresh pea shoots. For guests who didn't fancy fish, Judy had made a lovely green salad with hot halloumi cheese. 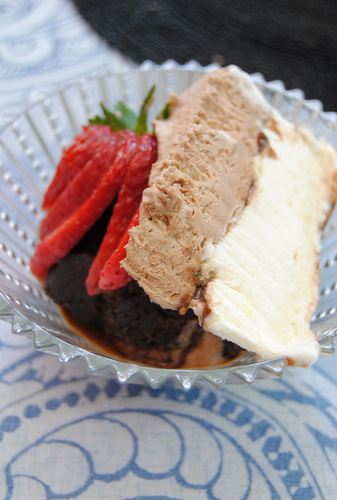 And then, dessert: a luscious double-layered chocolate and vanilla ice-cream cake, smothered in dark-chocolate sauce and served with hot chocolate fondant puddings and fresh strawberries. All this Judy did without breaking a bead of perspiration. She didn't eat a morsel of what she made - not many furiously busy cooks ever feel like eating their own food - but looked as happy as a puppy when she'd finished feeding and watering her thirty guests. 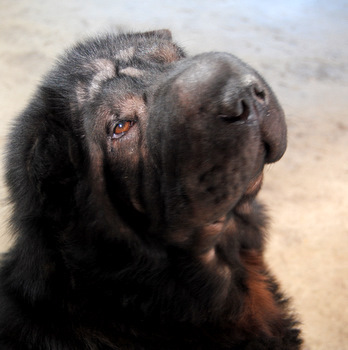 And, talking of puppies, here is the other star of the show: Tyler, a Sharpei puppy that 'belongs' to Judy's husband Barry. Hah! Guess whose baby Tyler really is? "...eating out often seems to me to be a shocking waste of money..."
This is exactly the reason why my eating out budget each month has shrunk quicker. I just can't eat at places like Perkins anymore because I think, "I could make this." :) I agree with you. I'd much rather go to a friend's or have them come over so I can cook for them. Food tastes so much better when it has a personality to it. I feel the same about eating out, but I was treated to a 5 course menu at La Colombe and yes, I did have th eBeetroot tart....truly inspirational!!! The natural light where this party was held will inspire me just as much as the food!!! I am lucky enough to be one of Judy's friends, and privileged to eat her creations regularly, including her birthday lunch (an eagerly anticipated annual occasion) Not only is experiencing her cooking a treat: it is also a totally inspiring event.